A successful business requires not just a fantastic product or service; it needs promotion and marketing to ensure that the world knows all about it. This generates more custom and ultimately more revenue and profit. The Internet is a massive arena for marketing and is somewhere where your company needs a presence if you are to be successful. At Chameleon we can look after your Internet Marketing campaign from beginning to end – getting online is easy, having an online presence however requires more time and effort. We have a 4 step approach to introducing businesses to the online world using tools which are at our disposal; Google Maps, Web Design, Adwords and SEO. Each element has its own merits and makes an impact on your online presence, but it is only when they are used in conjunction with each other that your online success can be ensured. In a bid to remain the top search engine, Google offers many different services to its user. One of the most popular is Google Maps and Street View which allows users to virtually walk down the roads of their choice. 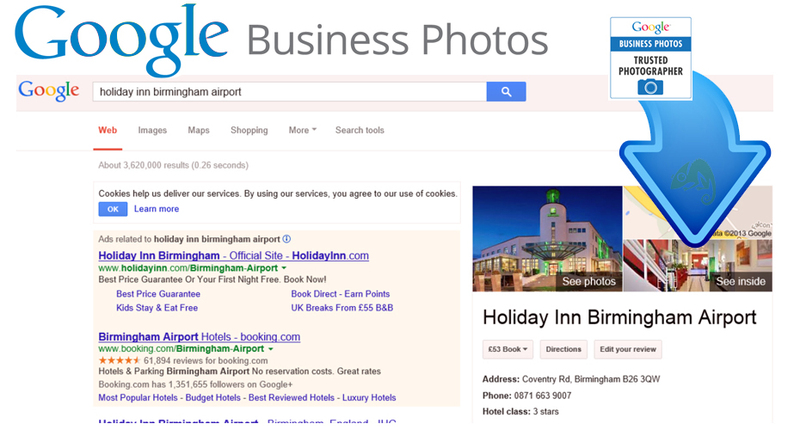 To add to this feature, they are now offering Google Business Photos which allow users to actually enter business premises and have a virtual tour of it. Chameleon have a team of Google Trusted Photographers who are experienced in adding businesses to Google Maps and Google Business Photos. The advantage to signing up to Google Business Photos, and the reason why it is the first way that we promote your business, is that it gives you an online presence almost instantly. This service does not require your company to have a website; rather it works off your Google+ page, which we are happy to set up for you. All big businesses and a large number of smaller ones have a website associated with their business; not to do so simply looks unprofessional. It is a common misconception that websites are expensive, Chameleon are a leading UK Web Design Company and offer bespoke websites at very competitive prices. We use content managed systems which allow you access to your website so that you can make small changes where necessary e.g. update information or add blog posts. We do not believe that you should have to contact us to make such minor changes and be billed an expensive service charge. Having a website developed will get your foot in the door of the online world, as well as allow you to have a professional email address which is related to your business. The next step is to make your website easy to find online and as the majority of Internet users will go to Google for the information they require, you need to appear in their search results; you need SEO and Adwords management. 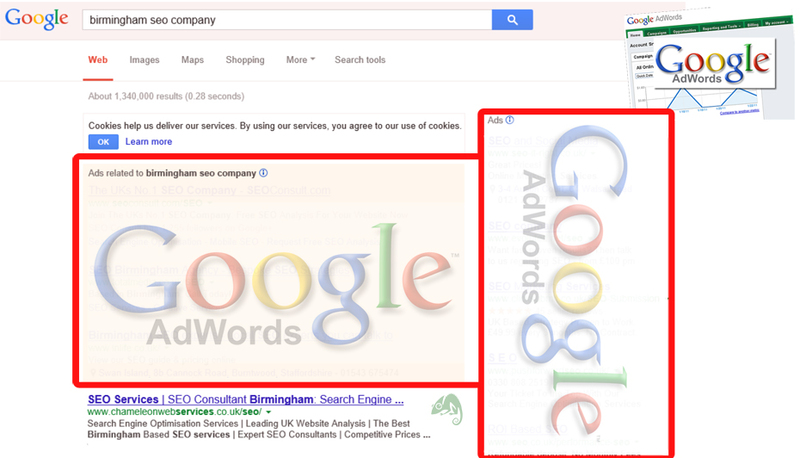 Adwords are paid advertisements that appear in Google search results above and to the right of the organic results. The main advantage of Adwords is that once the adverts are created, your site can be listed in the Google results immediately, encouraging traffic to your site and hopefully converting these into sales. In order to get the best results for the lowest cost per click, your Adwords campaign needs to be set up and managed effectively. We are experts in Adwords Management and have looked after many client campaigns, both large and small. We have an excellent understanding of this marketing tool and have had a large amount of success with our clients regularly being displayed in position 1 or 2 for their keywords. Internet promotion begins with ranking in search engine results for the keywords and phrases associated with your business and website. SEO is the process of making your site user and Google robot friendly so that it is able to be ranked highly in organic Google search results. We advise that an SEO campaign is set up alongside Adwords for all new companies as you will receive the revenue from Adwords traffic whilst building your SEO campaign; it should take 3 months for you to start seeing movement in organic rankings. This is our approach to promoting you Nightclub online; if you think that your business could benefit from this type of promotion, contact us today! Chameleon rated 5 out of 5 based on 131 Client reviews. One of the UK's Leading Web Design & SEO Companies.